Wondering why we are doing this post on our space at 30TH FEB because we are a brand management agency. Our client servicing team insists on sharing the significance of Mindful SEO Techniques and Content in your Branding Mix. Well this blogpost is about the basic SEO tips for your website. For those who plan to go digital with their business must take time to read this and understand as to why good content writing is the basic requirement for managing a brand in digital spaces. It cannot be just about posting stuff on your web spaces – namely Blogs, facebook, linkedin, pinterest or youtube for that matter. What matters is – how good is your content on each of it. Is the content good? Is it readable? Will people find relevance and truth in your content. And how it can be used as the best ingredient of your Digital Marketing. Let us understand the basic for Good SEO and understand through this Quick Guide to perfect SEO for your web portal. SEO stands for Search Engine Optimization. It is a methodology of getting free or organic traffic from search engine by doing different optimization practices. SEO is a practice or art of getting visibility in search engines to attract more and more traffic to your website. No one goes to the second or third page of google to search any piece of information everyone wants to be on the first page this is why SEO is needed because the second page of Google is the safest place to hide a dead body. Well if you are optimizing and you not on the first page, you are losing your valuable customers. Don’t worry I am here to guide you, how to attract more visitors to your website. 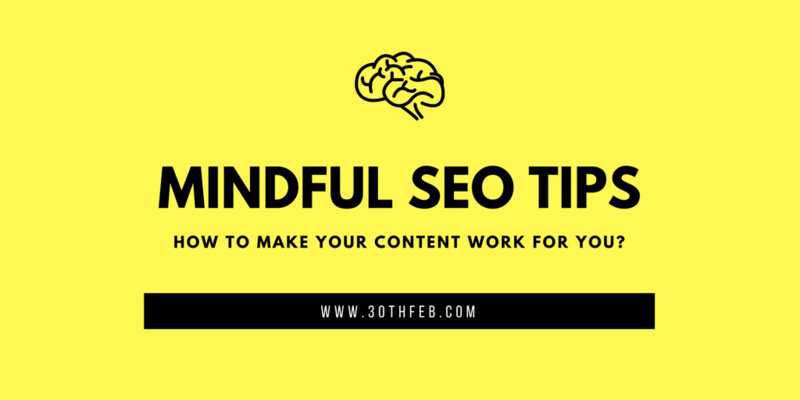 In this post we will be covering the mindful SEO techniques and content for on page optimization. The subsequent post will cover the details on SEO techniques for offpage optimization. Why Do You Need On-Page Optimization? Now, when some bloggers hear the term “SEO-optimized articles”, they think this is some kind of bad practice. Well whatever you call it, it’s necessary. Search engines are nothing but a set of algorithms. They look into various factors to rank your page for certain keywords. Now, we need to help search engines identify that target keyword from the post in order to make that post more relatable to readers. ON PAGE OPTIMIZATION– On page optimization refers to all measures that are done on our website itself to improve your visibility on search engine. It involves all the process that we apply directly to our website for getting visibility in search engines. If you are looking for some practical strategy that you can apply to your website for getting organic traffic then read further. Try to start your webpage always with your keywords making sense. The closer the keyword is with the beginning of the title tag more it has the impact. It allows Google to understand clearly what our page is about and what do we intend to tell. For the same, it is advised to keep the keywords in the beginning. Try to keep your URL short and optimized with keywords. Industry Experts say that good and optimized URL with keywords are easy to rank. The H1 tag is your headline tag. Use your most focused keywords in H1 tags, because heading tags are more easy to understand by Google and user both. Try to impress your audience with good infographics and multimedia to get maximum shares and reach. Make some eye catchy images and add them to your site with proper descriptions. Try to use your keywords in H2 tags to get noticed. It is always good to use your keywords in H2 tags. This is the reason why an SEO expert need to understand content marketing & content writing. Use your keywords in first 100 words. Place your keywords at every relevant important place wherever it is necessary. Keep your text to keyword ratio is 3-4%. Perfectly designed, mobile-friendly websites are loved by Google and people love everything that is loved by Google. So always try to keep your website responsive and user-friendly. Also note, Google has also started penalizing mobile unfriendly websites since 2015. Outbound links should be added as it is remarkable for relevancy score. If you are giving outbound links to high authority sites it is good relevancy score which is highly noticed by Google. It gives search engines a clear idea about your blog because of relevant links. It is the best way to make connection/relation with bloggers having the same niche. Internal Links also play an important role in ranking. It is one of the SEO ranking factors. Use descriptive keywords in anchor text that give a sense of the topic or keywords the source page is trying to target. Always link to the relevant page that allows users to navigate to different pages of a website. It helps to spread link equity to our every webpage of the website. Optimize your website speed as it one of the most important ranking factors of Google. Sprinkle LSI keywords in your webpage’s most relevant places. LSI keywords are synonyms that Google uses to determine a page’s relevancy (and possibly quality). Sprinkle them into every post. Optimize your image with your keywords by using them as the alt tag. Rename them with your keywords to make Google understand what our image is about, as Google doesn’t recognize images they recognize ALT tag of images. Use social sharing buttons in your very post to get more reach. Social signals may not play a direct role in ranking your site. But social shares generate more eyeballs on your content. Posting long quality and informative content is important. It helps in reducing bounce rate and also a ranking factor by Google. In other words, good content definitely won’t hurt your site. So there’s no reason NOT to publish awesome stuff every single time. It measures how searchers interact with your content. Better the communication, better are the results. The ultimate goal of Rank Brain is to determine if users are satisfied with your content. In other words, does your content match user intent? If not, it’s going to be VERY hard to rank. Fix all the broken and invalid links of your website as it is a bad signal, if someone is clicking on some link and it is redirecting to no found it is really a bad experience, so just check your broken links and fix them. To maintain the site and to keep it effective in the world wide web, it is essential to keep a regular check on the website SEO, it is not just about linking things to each other – it is a lot about logical linking & consumer insight as well. So stop counting the number of Backlinks you have and keep a tap on relevant & effective backlinks.